A nice touch in any child's play area is a chalkboard. Save the money on fancy easel displays or a full-blown hanging board and just paint a wall area with chalkboard paint. This type of paint is now available in any color and transforms your wall into an actual, erasable chalkboard for a fraction of the cost. Benjamin Moore has a great guide to chalkboard paints, as well as some excellent ideas on how to use these paints beyond the walls. Storage containers are a necessity to corral the sea of toys most kids seem to have. A great and attractive way to do this on the cheap is to decorate large, sturdy shipping boxes or extra-large diaper boxes. You can try ideas like covering the boxes in brown packaging paper and letting the kids paint or scribble on them. Or, if you are going for a more sophisticated look in a common area, find fabric you love and cover the boxes using glue. I took a hodgepodge of fabric pieces I had lying around and glued them to a giant shipping box to use in our playroom. It makes a great stuffed animal holder. If you are handy sewing, then by all means making a square floor cushion for the kids to lounge on is easy and economical. However, if you are less than jazzed to fire up a sewing machine, there are still some cheap options. Check out affordable floor pillows and poofs from crafters at Etsy, where there are always some very economical, hand-made styles. Don't forget to check sale areas and clearance racks at superstores and discount stores, where there are usually some decent choices, too. Even if your kids are not budding artists, there has to be something they have made in school or at home that can easily get framed and hung on the wall. Some of my three-year-old's abstracts are perfect for this cause. Find a discount frame, and you have instant wall decor. Personalizing the space with such creations can add flair to a designated kid's corner or playroom and also make the artist proud. If you are looking to add some shelves or small bookcases, many inexpensive options are available to accomplish the task. Some options, such as storage cubes and crates, only cost a few dollars. Single wall shelves that you can install yourself, like those from Ikea, are also great options often found for under $20. Or, make a corner useful and look for some budget-friendly, free-standing or wall-installed corner shelves sold at many big box stores. For the more adventurous DIY types, consider other affordable solutions, like making your own bookshelves. The possibilities are endless. Often, children's furniture has a huge markup compared to non-kid items. With a little creativity, however, you don't need to buy super expensive kid's furniture to make your playroom complete. Look for cheap coffee tables, other low-height tables, stools, or ottomans that can do double duty as children's tables or seating. I randomly searched online to find a padded, faux leather, living room ottoman for our young daughters to use. There are no sharp corners and it's the perfect height, and it cost all of $40. Or search online to track down kid's tables and chairs on sale, and avoid paying the hefty mark up that many name brand furniture retailers charge for full price items. For kids that like to draw or make crafts, consider designating one of your table finds as an art center. You can easily use your table to keep art supplies lined up in containers and within easy reach. Clean and reuse small jars, such as old jam or salsa jars, to hold pencils, markers, and paintbrushes. You can also paint or wrap ribbon around these holders for a decorative touch. Shoeboxes, which can also be embellished to your liking, are great to store crayons and paper scraps, while small jewelry boxes and old spice jars can hold anything small from beads to glitter. Kids like to play on the floor. This means that any flooring can get worn or messy. Find a cheap carpet that works in your play space to not only create a comfy place to sit, but also limit the damage to your area rug or hardwood. Carpet tiles are a cheap way to accomplish the task and can be re-arranged and cleaned easily as compared to a rug. There are also foam kid's floor tiles and mats, which often cost a bit more than carpet tiles, but are still pretty affordable, not to mention extra cushiony for smaller kids. Kids love stuff with their names on it. Using monograms on the wall or as labels in a play space is a nice way to decorate and stay organized. You can do cheap stencils on the wall for a just a few dollars by investing in some paint and a craft shop stencil. Or you can find affordable papier mache or large cardboard alphabet letters at craft stores, which can be painted and mounted on the wall or just placed on a shelf. You can also make attractive name labels on your own computer using free templates online, such as the ones found at Better Homes and Gardens, which are great for labeling toy boxes and containers. You can easily add a bulletin board or dry erase board to the wall of any play area for well under $10. Dollar stores sell small dry erase boards that you can line up in a row for kids to scribble on or play games. Craft stores and discount home stores also have bulletin board options for older kids looking to hang pictures or artwork. Little touches like these can help make the play area personalized and more inviting. 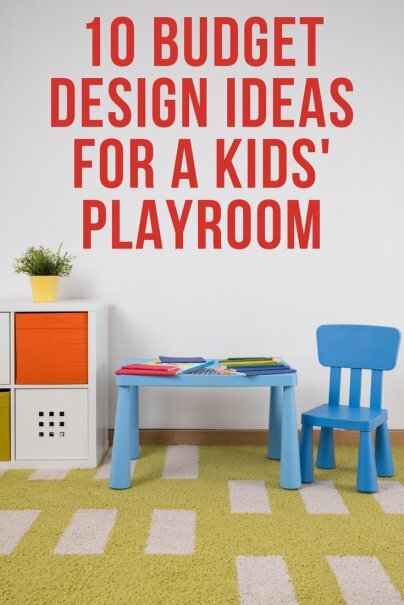 What are your best kids' playroom design ideas? Please share in the comments!